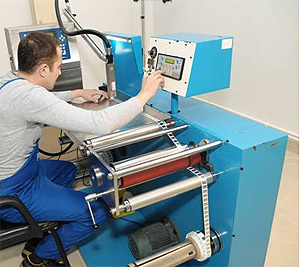 HOML – RW type Automatic Rewinding machine that is applicable to Rewinding the labels roll in a straight form that is also applicable to inspect the labels tape on line & complete set of product for auto auto die cutting machine. It has the functions such as auto calculator dial, set length, auto stoppage, and Hydraulic web guide system to control the feeding & to keep the straight of labels edge. It is characterized by tight construction, fastness, high efficiency, accurate for rewinding the labels tape, ease of operation and stability in operation.